I love to give worn out, dated, tired things new life. It makes me think about how I always want a second chance, and how that is exactly what you are giving that thing you are re-purposing. Of course it is a ‘thing’ and not a ‘person’, still we humans get some satisfaction in the redo. And so I had this shelf sitting around on my back porch. It had become faded from years afternoon sun back there. I looked at it one day, and decided it was time to give it a fresh look. I used a matte off-white spray paint. After the paint dried, I hung it on the wall. Here is what I had in the spot before. And here it is with the dishes on the shelf. I tried to use dishes that were either purple, green or both. If you are looking for dishes to display, it often has a more unified look if there are fewer colors displayed. Here I used vintage green and purple cabbage bowls. The plates are American-made, hand-painted. I tried not to overload the shelf, something the professional magazine stylist taught me. That is difficult for me, because I have SO. MANY. DISHES. Still I think I showed great restraint. I also added a few glass items to the shelf. This room is very neutral and doesn’t have a lot of color, and that is why I thought it was so important to add these colorful dishes. The white always looks so fresh and clean. I love the wire shelf with it’s new coat of paint. I also wanted to point out that plates work well in place of artwork and can be used to add color to a room. If you get bored with the color, simply change out the dishes. I’ve got lots more dishes, so I can always go with a different color if I ever get bored with the purple and green. I realized after I posted yesterday that the link for the Bona $3 off coupon was not working. I apologize for that!! I am including the correct link today for anyone who wanted the coupon. I love the purple and green color scheme-it looks like spring! Just what I needed to be reminded of on what is to be a snowy day in Delaware! 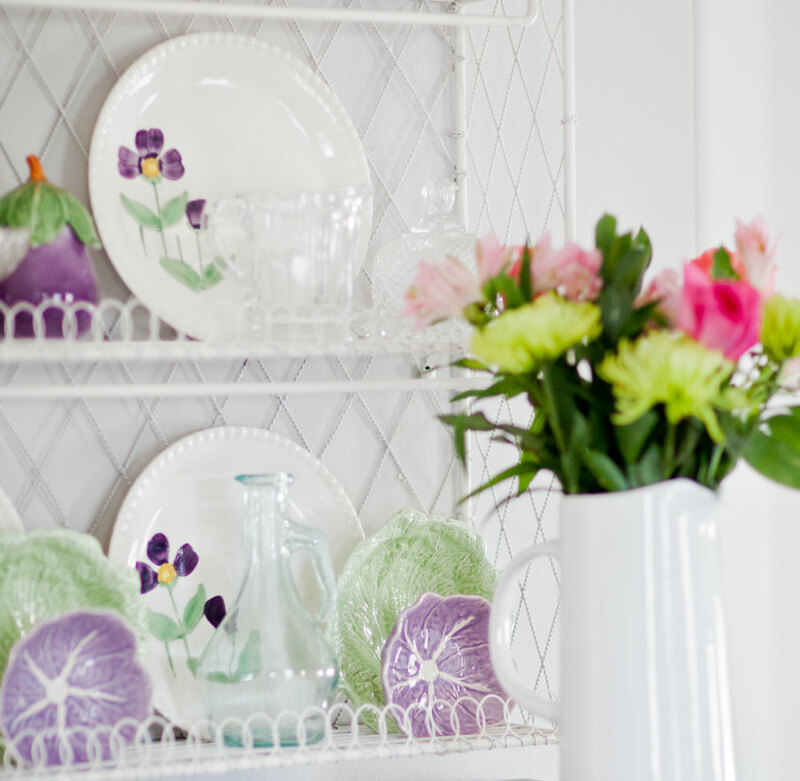 Love,love,love the cheerful dishes on your freshly painted shelves! Love the green and purple pops of color. Hopefully Spring is around the corner. I love the purple and green color scheme. My friend gave me a set of tea cups and saucers in a purple, green and pink floral pattern, and they really brighten up the corner I display them in. Your display is an inspiring reminder that spring will soon be here. Love that shelf and those purple and green bowls are beautiful displayed there. I am so copying this. 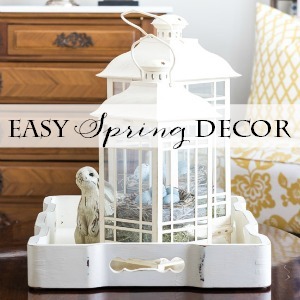 LOVE LOVE LOVE your little wire shelf and all the pretty spring things you put in it! When I think of Easter and spring I think of green and purple. I adore those colors for spring. 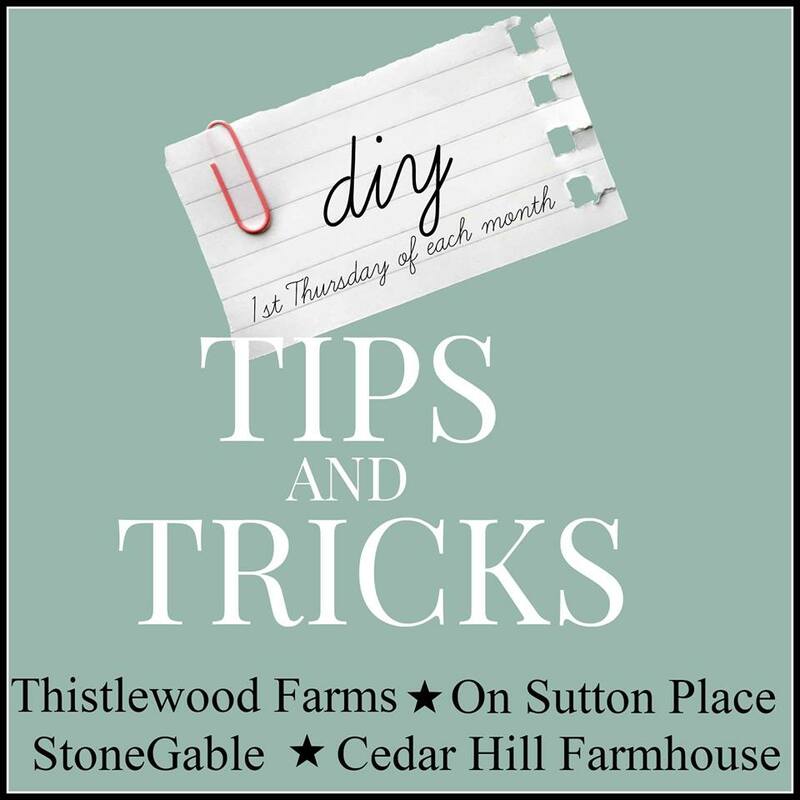 Thanks for the great tips and tricks and how to arrange a shelf. You are amazing, my friend! That really made your shelf,it looks wonderful. 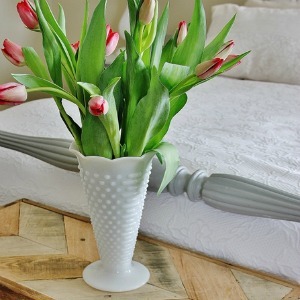 I love the idea of the dishes for some spring decor now my mind is thinking of what iv’e got and where to put them,i better get to it,have a lovely day. 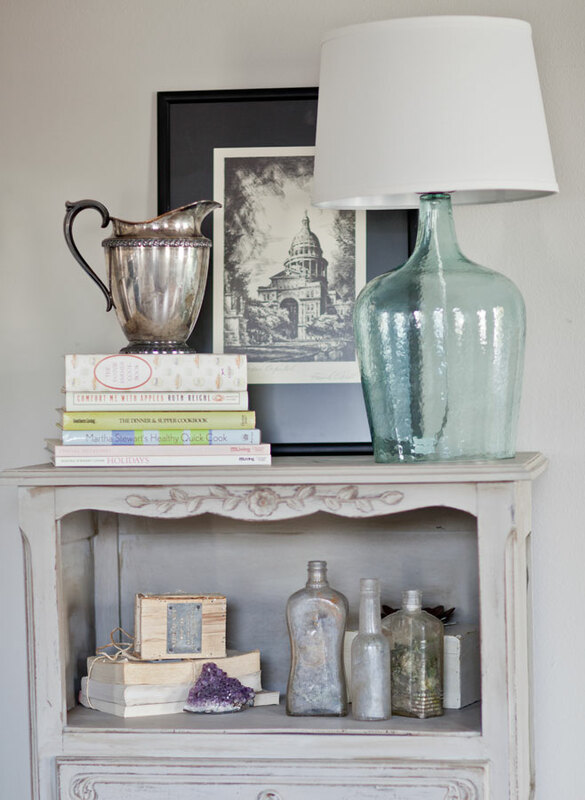 LOVE the re~purposing of your shelf, dear freind!!! Black, white, green, soft buttery yellows and purple all translate into Spring!!! I love your combo of green and lavender. It is so fresh and pretty. I am a plate lover so this is right up my alley. Well done! Love the addition of your new shelf. Your dishes are so pretty! Happy spring to you friend! Tell me the plates are Blue Ridge Pottery!! BR or Southern Potteries dishes and novelty ceramic ware was made in Erwin, TN, a tiny mountain railroad town nestled in “The Valley Beautiful” in upper East TN. The plant employed dozens of local women who hand painted the simple, beautiful, colorful designs on dinnerware, vases, Toby jugs, graceful pitchers and tea sets that were given away as sales premiums and were inexpensive enough that even depression era homes could have a piece brightening a shelf! My designated “collection” is of 24 dinner plates in 24 joyous patterns- plus, I have too many irresistible sweet pitchers and seasonal bits. Oh, and I was born in Erwin and lots of my family are still there. I think they are C. Love!! OH … it’s gorgeous. It was an immediate “ooh aahh” from me. Those COLORS. Hope your week has been as sunny as this arrangement. That arrangement of plates and glass dishes as well as the colors makes me hopeful spring is right around the corner. Lovely. Those are some of my favorite colors. This makes me wish I had more places to display plates. It’s amazing what a paint job can do ! Love the way it all comes together and the darling plates too. Yesterday I read the story of the colored dishes in your white cabinets getting changed out for white dishes. What a time that must have been! It’s great that you found a way to keep some colorful dishes too, because this is so pretty! Since this was posted in 2015, I’m going to go out on a limb and just say your love of purple and green has not diminished, as evidenced by your gorgeous purple and green toile bedspread, and your “color of the year” I’m now crushing on! 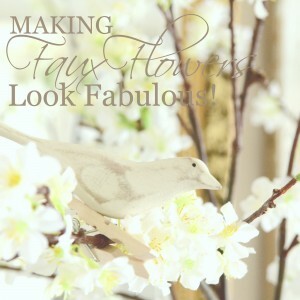 I just recently started following your blog which I absolutely love!! 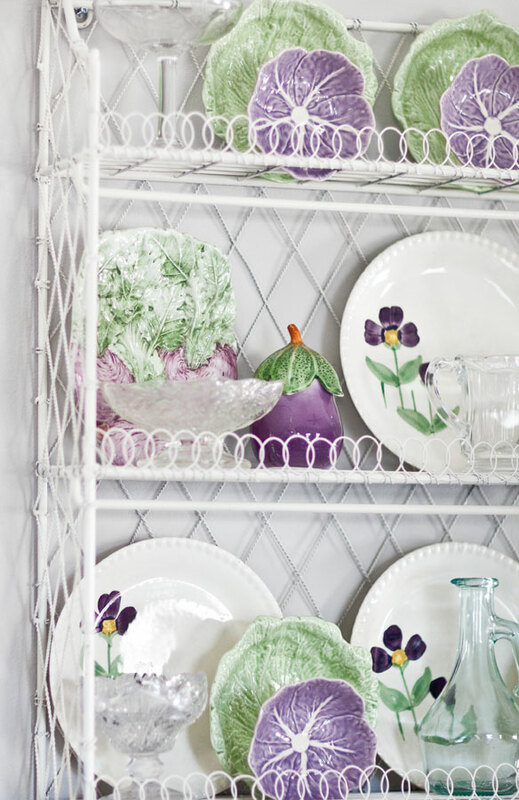 And I also fell in love with the wonderful shelf that you painted white and have displayed the purple/green/white dishes on. 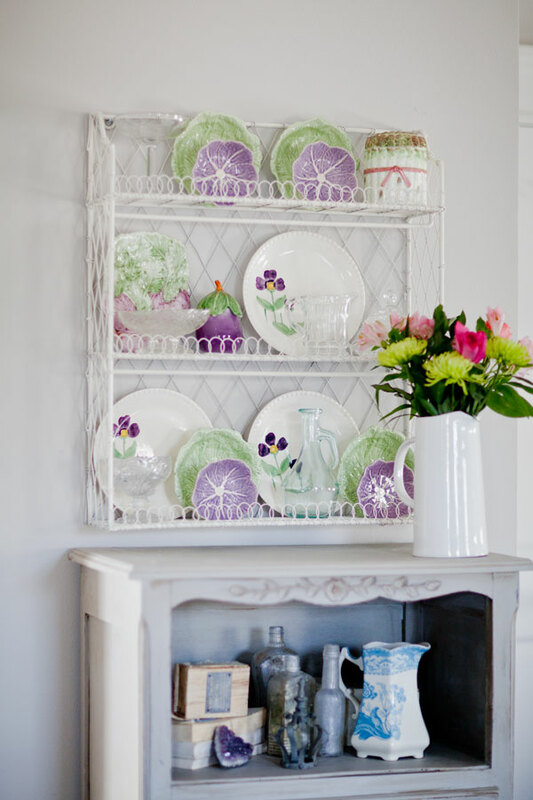 Do you have any idea where I might find a plate display shelf like the one you have? 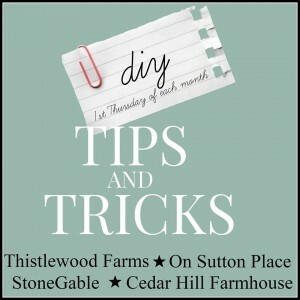 Or do you ever sell any of the items that you show on your blog? 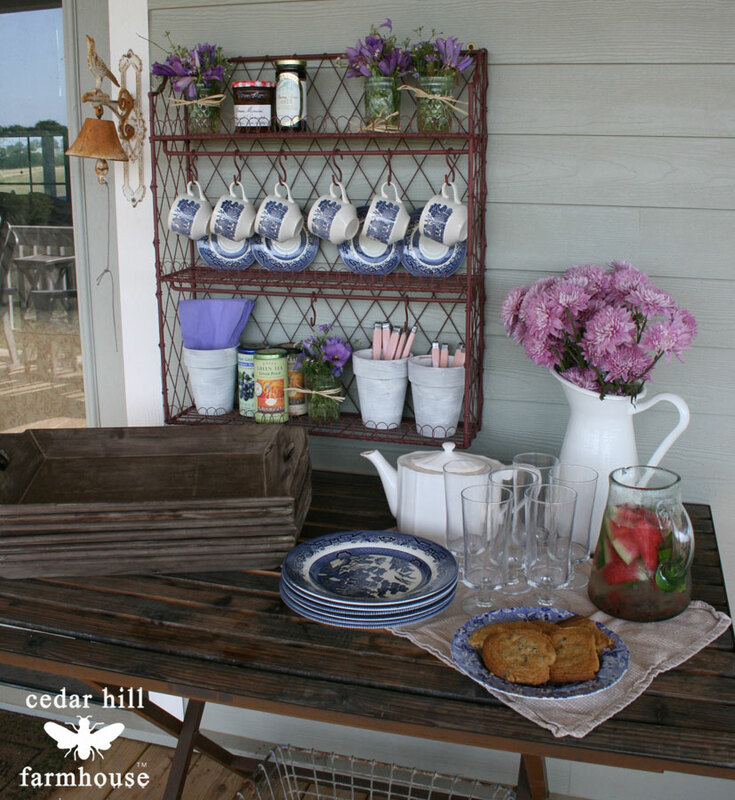 I would be in heaven to find something that lovely to display dishes on.